Spider-Man PS4 closed out it’s trilogy of DLC chapters last month. However, this doesn’t mean that Insomniac Games isn’t done releasing new content. Marvel has revealed that a new update will include two new suits for players to wear as they swing around the game’s digital facsimile of Manhattan. 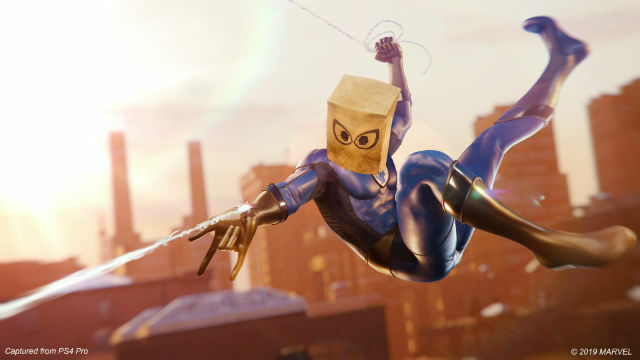 Gamers can now choose between Spidey’s Future Foundation duds or his less flattering Bombastic Bag-Man outfit. You can check out Marvel’s announcement, along with a photo of the suits as they appear in the game, via Twitter below. In the comics, Peter Parker donned a spare FF uniform after Marvel’s First Family helped separate him from the alien symbiote that later became one-half of Venom. In lieu of a mask, Johnny Storm (the Human Torch) offered Peter a paper bag to wear over his head. As a joke, Johnny also taped a “Kick Me” sign to Peter’s back. Years later, the Fantastic Four renamed their team the Future Foundation after Johnny was apparently killed. At Johnny’s posthumous request, Spider-Man was enlisted to join the team. Each of the Future Foundation’s members wore striking white suits, including Spider-Man. Obviously, this isn’t the first time that an update to the base game has added new threads to Spidey’s wardrobe. Each round of downloadable content included three new unlockable suits. And during the holiday season, Insomniac made plenty of fans happy when they finally added the costume worn by Tobey Maguire in Sam Raimi’s original Spider-Man film trilogy. What are your thoughts on these latest additions to Spider-Man PS4’s assortment of costumes? Give us your impressions in the comment section below!